WAIT. THIS IS NOT BORING or really complicated. SEE BELOW. THIS EXPLAINS EVERYTHING, OVER AND ABOVE ANY ELECTION. WHY THINGS ARE THE WAY THEY ARE, AND WHY STUFF HAPPENS THE WAY IT DOES. IF YOU DONT UNDERSTAND THIS, IT'S POINTLESS THINKING ABOUT WHAT AMERICA IS REALLY ABOUT. (If you think YOU "aren't political", that thought was manufactured for you, as a reality to live. "Go away." It’s easier for them to get away with screwing us if most of us don't know and don't care.) Look at this 1998 pie chart. First off, lets be blunt: In the above chart, the people in the Black sector and the top Red sectors (5-10% of Americans) who own the "liberal media" a.k.a. the so-called free press, use their media system to convince all the people in the lower pink and green sectors and the people near the top of the white sector that ALL the economic problems in America are caused by the people in the very bottom of the white sector getting too many domestic programs and too much money at work. The current reality is actually much more extreme than this 1998 version. Get it?? Is this ridiculous or what? Were you fooled too? This illustrates the results of the extent of corporate handouts and welfare for the rich. TAKE THE RICH OFF WELFARE!! They also pay giant, huge, out of the spotlight Public Relations and Law firms (at the Fortune 500 level) to convince you that the really important issues are NOT about wealth. No, the really important things are contentious social issues like God and Gays. Problems like "how many angels can dance on the head of a pin". Let’s have a government ruling on that. DIVIDE AND CONQUER is a think-tank strategy for population control, being perfected since the 1930’s. see Walter Bernays. They inject controversy to get the public to argue back and forth about "issues". It must be fun and fascinating for them, like messing around in an anthill with a stick and can of lighter fluid. Also, it’s profitable for them, and lowers risk of investment, since a people divided cannot stand up for themselves. Can people have "negative wealth"? Yes, almost one fifth of American have no assets or they have negative assets -- that is, their debts are larger than their assets. 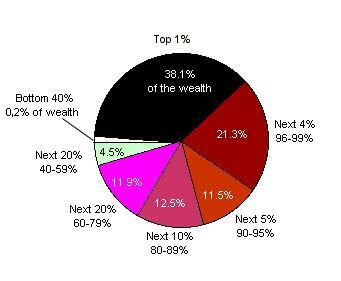 The top 10% own 71% of all private wealth. The top 1% now own more than the bottom 90%. Among the industrialized nations, the U.S. has the highest concentration of individual wealth -- roughly 3 times that of the No. 2 nation, Germany. By the way, if you are reading this, and you know me or one of my friends sent this to you, you can rest assured you probably live in one of the bottom 3 sectors up to 60% of the population. But even if you live in the fourth sector, 80%, then you can see by the chart that your role is to work hard and give your wealth to the people in the top Red and Black sectors. Oh yeah, don't point these statistics out either, don't mention that the Black sector gets way more government social programs than the white sector, because that would be "class warfare". They just don't call them social programs, they call them subsidies and tax abatements and loan guarantees and research grants. Wealth protection was designed into the system in 1776, but since then it has been expanded out of control. James Madison, Abe Lincoln and many other patriots worried about what we are seeing today. The wealth at the top is understated, because the poor and working class can't hide their paychecks and bank accounts (if they have banking) while the wealthy can and do hide everything possible. When possible, they pay NO Taxes. A few years ago, seven Fortune 500 companies combined paid less taxes than a mother of four earning 23,000. This has gotten more extreme since 1998, and even more extreme in the last 3 years, by design, by legislation. The number of persons in the teensy-tiny white sliver is forty times larger than the number of persons in the black sector. The number of persons in the the teensy-tiny white sliver plus the green sliver combined = sixty times the number of people in the black sector, and six times that the number of people the black and both red sectors. The white green and pink combined represent 80% of the people in America and about 16% of the wealth. Latin America, Africa, Asia, and the Middle East is worse, our CIA makes sure of that. Add on the purple to the white green and pink and that's 90% of the people in America. Six figure income families are falling FAR behind. Even low-seven figure incomes are falling behind. The three top sectors represent not people in the $150,000 range or $800,000 range, but people in the hundreds of $millions up to $billions. This is Bush's billionaires, (and Clinton's billionaires and Kerry's billionaires). Only a very small number of people cross over from one range to another in their lifetime, if they are very very very lucky, diligent, crafty, and well-connected. Over recent decades, a large number of voters in the white sector are loudly demanding more money and perks for the people in the black sector, and less benefits for the people in the white sector. It's like we were put in Chinese Re-education through Labor camps to be brainwashed. The black sector of 1% represents largely a few extended families. This spread is actually accented even more when the black sector is broken down in to 10 parts of 0.1% apiece. The tip-top 0.1% of the people hold the bulk of the whole black area. This is the Rockefellers, the Morgans, whatnot. Way above the movie stars and politicians. This chart does not represent successful hard working Americans getting wealthy. This does not represent hard work at all. Are you kidding?!!! People in upper-upper wealth do not work. They get the system to work for them. They don't get a paycheck, they get earnings, off the labor and productivity of the people underneath them. I do not fully believe, like a devout Marxist, that earning something off investment or by managing the labor of others is necessarily 100% immoral. However, in my opinion, this rigged system creating drastic disparity of wealth described above definitely constitutes immorality. (A few very wealthy folks in America agree, such as Bill Gates Sr. and Warren Buffett.) It also renders "democracy" meaningless. If you try to change this or point this out too loudly, they will jail you or have you killed if you get famous and powerful, just like Martin Luther King and many others. Mostly, they just prevent or obscure discussion about this in the media. They don't want lots of people thinking about this. Instead they talk about "mosquito" issues, like "Jesus" and "school prayer" and "poor people getting abortions" and "nasty music" and "Saddam's moutache" and "Brittney's marriage" and "one missing child in Peoria" and "broken glass in Seattle" and .. well, mosquitos - the West Nile Virus - ... and such, because they can hide this chart behind all that controversy. Note: They are not above using the name of Jesus in vain, for their own benefit, if it can help hide this chart. THINK for a minute: Regardless how you feel personally, Do you really think they care about you, and whether or not you have an abortion, or watch some immoral movie. Only to the extent it helps them stay in control and keep you stupid. Their contempt and sheer hatred for democracy is astonishing. They can also start wars for their own reasons, and they can manufacture reality to suit them. Don't you dare think they can't. If you think you "aren't political", they manufactured that thought too. So go back to sleep. They can and do manufacture reality, and they pay a lot of money to companies that specialize in that, giant "under-the-radar" Fortune 500 firms called Public Relations, a.k.a "propaganda" or "spin". They can manufacture patriotism and outrage and most other public sentiment quite easily. They can manufacture issues they want you to worry about, and hide issues they don't want you to see. They even create "social justice" front organizations. The State Dept. and CIA has done that in both foreign and US media for years, with planted disinformation, movies, music, etc. They can make it difficult to find out what's really going on. Wonder why the schools are getting dumbed down? In dictatorial takeovers, government forces sometimes kill all the intellectuals. In the US/World revolution here, they just kill the intellect instead. Takes a few years longer but less dead bodies. They own the "liberal media" and the "conservative media", except for a little renegade stuff, but they're working on locking that down too. They have their own armies, called the CIA and FBI, FEMA and other agencies. Top CIA executives all come from Wall Street, including the Stock Exchange. The National Endowment for Democracy is a front for Nazi CIA-type activities. The PATRIOT Act is for them, to be used against us, as needed. like taking over a good, sound company, sucking the wealth out, and destroying what's left over, while throwing people out of work. Much of our tax dollars goes directly to the black and red, in the form of various corporate subsidies and laws that secure advantage. Much of the wealth therefore comes directly or indirectly off the backs of the 60% poorest people in America and also the absolute destitute overseas who cannot sell their labor for enough to eat. This is where our jobs are going. So in America, this chart represents the sucking of wealth from the white and green and pink up to the red and black. they bring about the destruction of the world, step by step. The revolving door in Washington is between far right think tanks and Wall Street, excluding the general public. This is the accellerating Third World-Ization of America, moving to the mode where a tiny elite holds a more and more vast portion of the wealth, middle class is very small, and poverty class grows larger, with destitution rising and social net eliminated. Argentina, Brazil, Poland, Indonesia, Sudan, Somalia, Egypt, Haiti, Nicaragua and other poor countries were all designed in that manner, often by the US or our allies. Some had natural wealth of fertile land and crops, if not industry, until "economic development" reversed all their gains and removed their wealth. A former World Bank Senior Vice President and Chief Economist testified to that fact. Next stop for that train is the USA. OH, just for comparison: In the former Evil Empire, USSR post-Stalin, (and Cuba) reports say that widespread repression was rather minimal, very little in the way of Police crackdowns, even compared to the USA. The spread between richest and poorest was kept at a modest 7 to 1 ratio, not 14,000 to 1. And so people didn't experience dire poverty, despite the US-led Arms Race on what was a very poor country. This explains WHY they wanted YOU to know that the USSR was evil. Not because of God or Atheism. Because their scheme of economic democracy would be very evil to the Black sector.